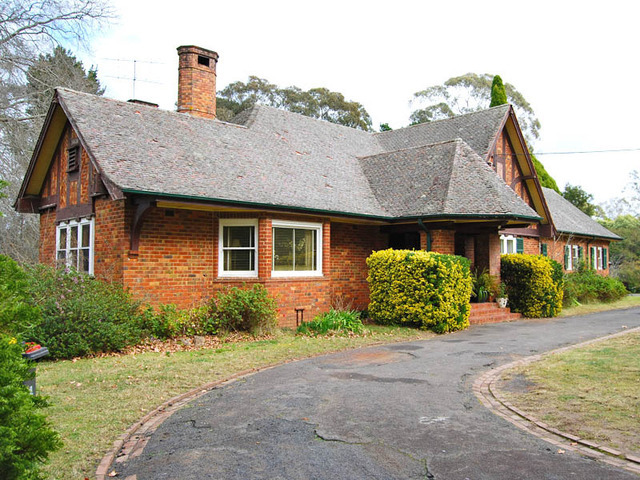 “Burradoo was established about 125 years ago as a hill-station retreat for Sydney’s wealthy. 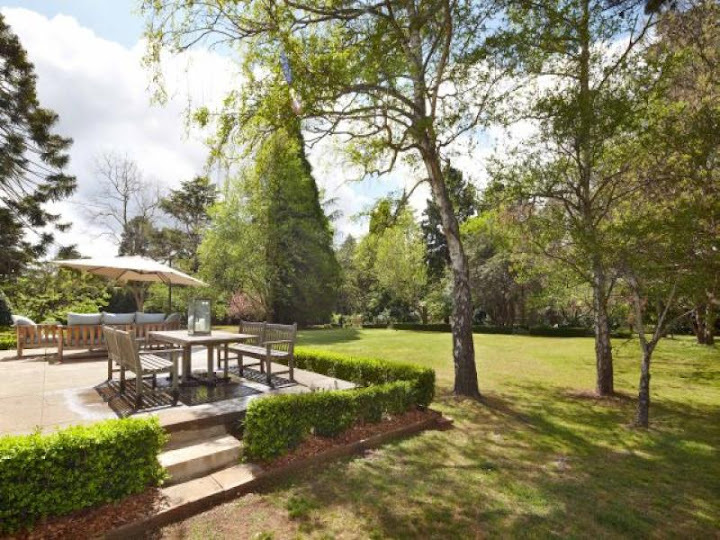 It is an elegant residential area near the township of Bowral. “About 130 kilometres from Sydney and 661 metres above sea level, Burradoo is divided by the busy Moss Vale Road: the exclusive western side and the eastern side locals refer to as“Burradon’t“. “Of Burradoo’s 1100 homes, about two-thirds are permanent residences for retired Sydneysiders. The other homes are used as weekenders and holiday houses for well-heeled Sydney folk. – the Domain website,www.domain.com.au, has more than 170 listings. About 20 Burradoo houses have traded this year at prices ranging from $475,000 to $2.2 million. “People move there because … Burradoo is a quiet area with tree-lined streets and a choice of lovely homes set in cold-climate gardens. 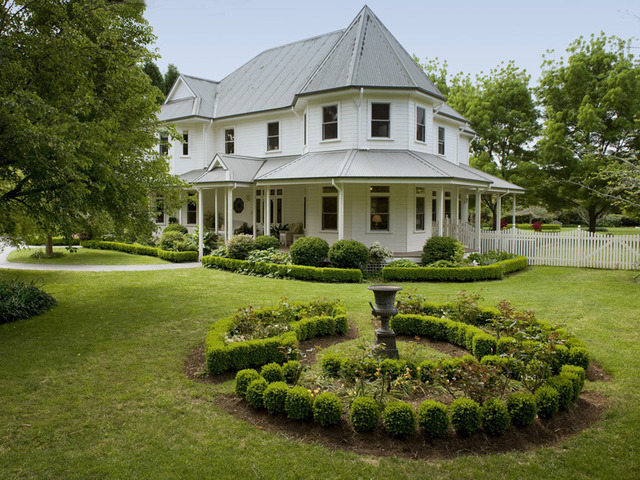 It’s only three minutes’ drive from Bowral’s shops. “Prices for homes on the western side of Burradoo range from $1 million to more than $6 million. On the eastern side, house prices start at about $500,000. 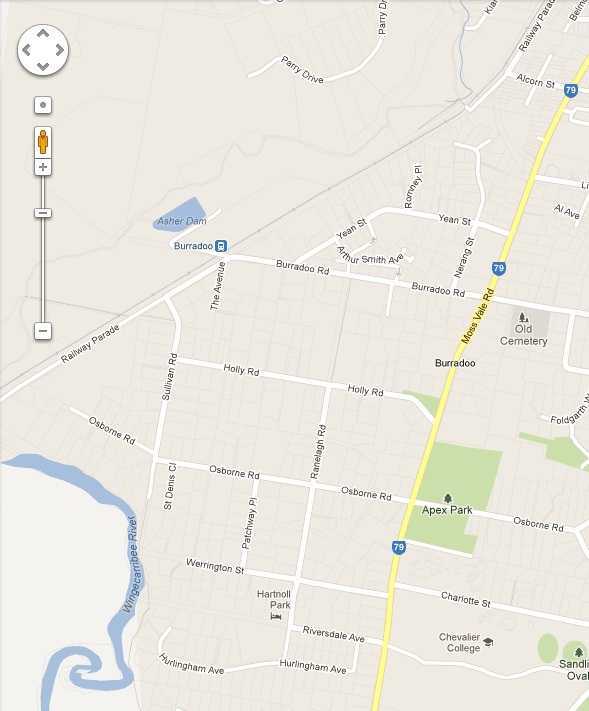 “This “right” side (of Burradoo) encompasses the Golden Triangle bounded by Riversdale Avenue, the railway line and Moss Vale Road. 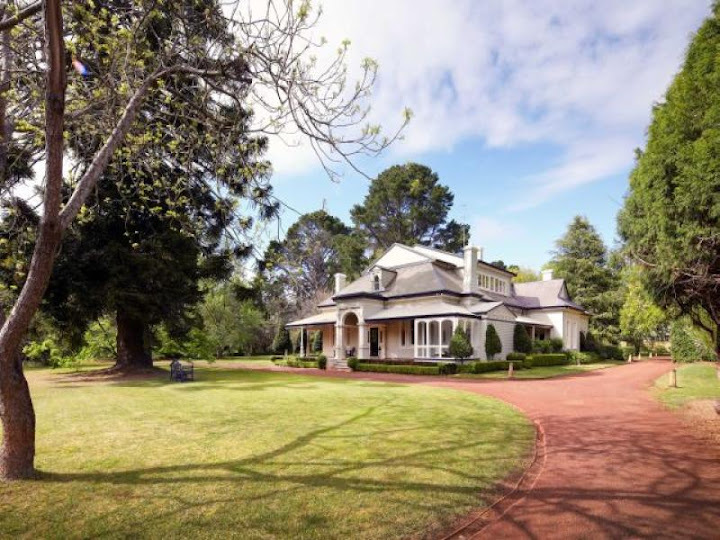 “Set upon 2.68 hectares, Kerever Park offers one of the most sought after residential locations in the Southern Highlands. The residence is of extraordinary dimensions and is adjacent to additional cottages and outbuildings. A most significant feature of the property is a magnificent garden of true beauty. 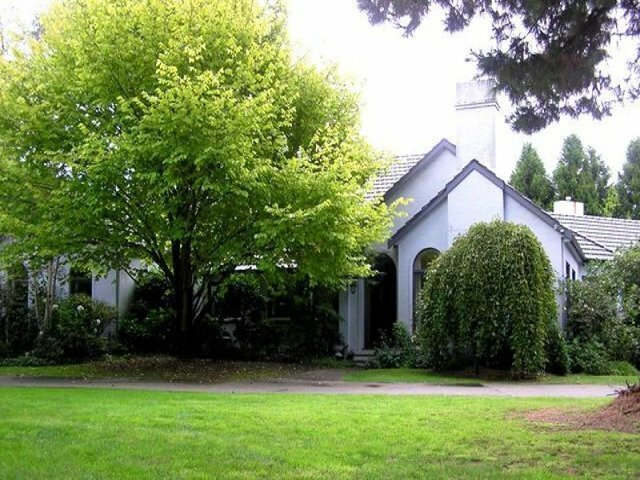 Yean Cottage is a very large and elaborately decorated Queen Anne Revival style house, with an extensive and very fine garden. The design of the house and the interior layout is copied very closely from a house called Queensmead Cottage at Windsor U.K.
Queensmead Cottage, built when the Queen Anne Style was at its most elaborate flowering was a collection of all Adams ideas on Queen Anne. 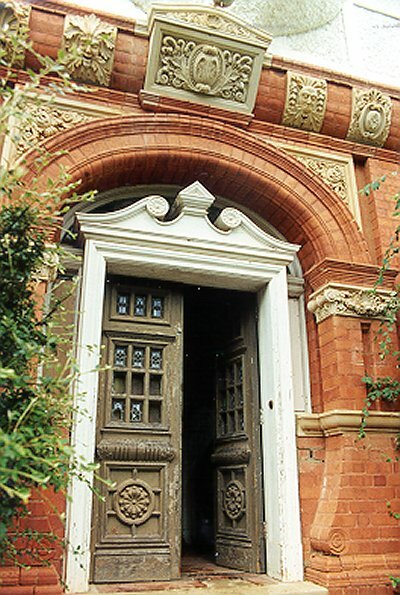 Anglewood faithfully follows much of this idiom, elaborating on some, such as the arched brick bracing between chimneys at the east end and giving an Australian flavour to others such as Australian plants appearing in moulded plaster detailing. 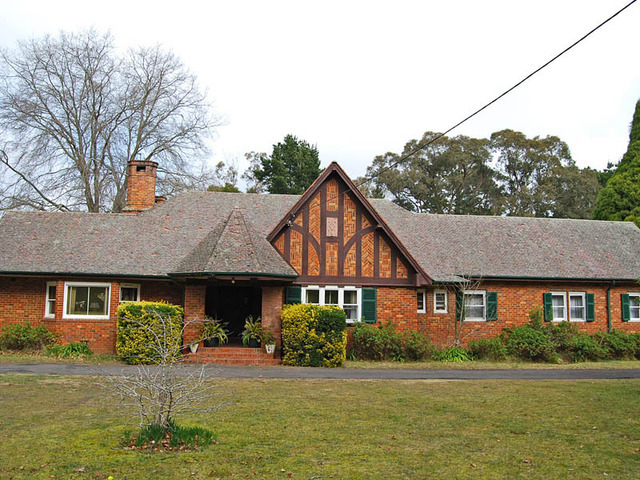 The exterior of Yean Cottage is principally a soft red brick, much of it moulded or carved in finely detailed ornament. The bricks are said to have been imported from England especially for the house but this has not been established. The first floor is timber framed and clad in terracotta shingling, hung with patterned bands of cut tiles. The walls of the first floor bay over the entrance are clad in rough cast render, as are gable ends and bands under some of the eaves. Much of the decoration is very unusual and possibly unique in Australia. Around the entrance bay, at string course level, are a series of curved sandstone blocks with shields, gargoyles, mashs, acanteurs etc. This work is very fine and appears to be in perfect condition. Inside are fine timber panelling, moulded plaster, faience panels, colourful tiles and stained glass. Above the entrance hall was a three storey central light well with coloured clerestory lighting, now covered over at each floor level. There is a pleasant conservatory on the garden front. Quite a few alterations have been made internally, but some care has been taken not to destroy original material. A modern addition on the west side has occurred as is an external fire stair on the east end (Heritage Office 1988). “Anglewood is an amazing Queen Anne style residential building recognized bu the N.S.W heritage council. Built by Arthur Bruce Smith in 1890 original on 31 acres as country residence then acquired by Dr. George Sly Founder of solicitors, Sly & Weigall. Then in 1932 acquired by Thomas Knox for a boys school prior to the State Government in 1943 operating it as a children’s home until the early 1980-s. Anglewood was entirely closed in 1992. Mr Valdis Berzins purchased Anglewood in 2000 and went about on extensive renovations and additions, also building a tennis court and subdivisions of the acreage for residential housing. 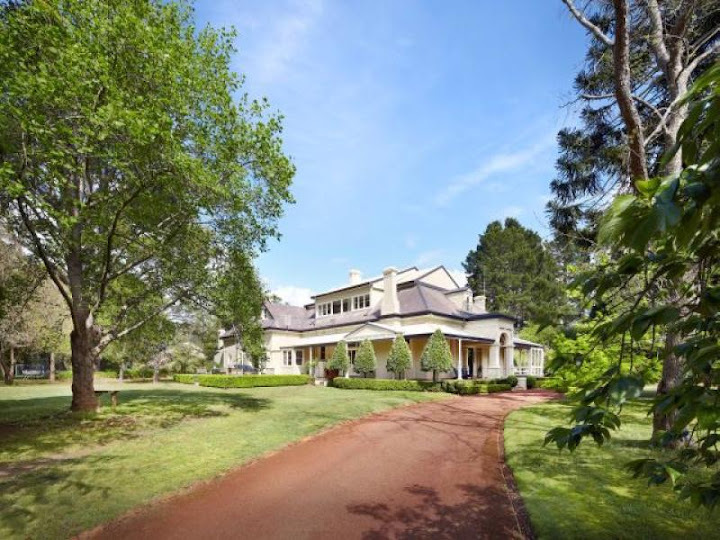 One of the finest estates in Burradoo . 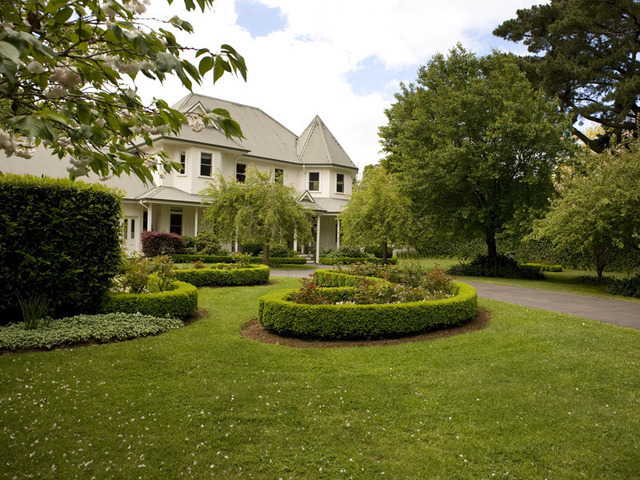 Laurel Park is a stunning, John Sulman designed residence built in 1886-87 for the Honourable John Macintosh. For sale in 2012, price on application. It is a magnificent residence recently renovated and decorated to an exceptionally high standard throughout. Set on approximately 3.89 acres of beautiful gardens including magnificent trees and hedges, that are fully fenced, access is via a long driveway with auto gates. Enter through a grand hallway with exquisite chandelier and with exceptionally high ceilings throughout, house comprises drawing room with open fire, wide bi-fold doors to formal dining room with open fire and French doors to the verandahs. Glorious new modern kitchen with brand new 4 door Aga, marble bench tops and full butler’s pantry. A wonderful light and spacious family room with s/c fire that backs onto a cosy TV sitting room and leads into a Hampton style boot room. Six very spacious bedrooms, main and guest with dressing rooms, four bathrooms (two ensuite), upstairs an amazing games/rumpus room with two of the bedrooms both attic style and a bathroom. Externally, the house has a wide, wrap around verandah, an inviting wide terrace off the family room and a sun-baked private courtyard. Four car garage and work area. 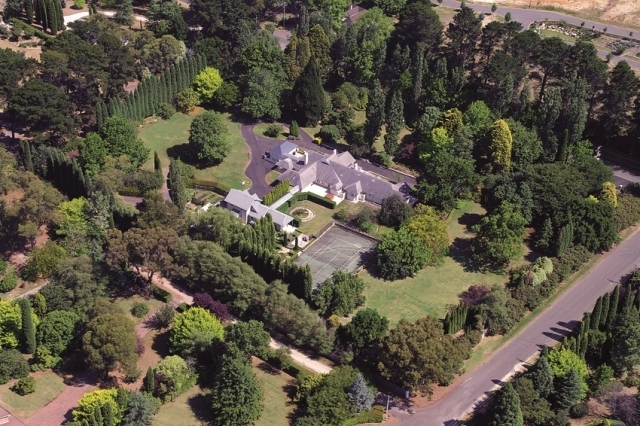 Green Loaning on 4 acres, may potentially be the best residential estate in the best street in the Southern Highlands. Peddle, Thorpe and Walker designed and master built by Alf Stevens circa 1935, this generously proportioned, elegant fusion of impressive detail includes circular driveway to stunning roof with glazed shingle tiles, drawing room with vaulted ceiling, dining room, library/den, 5/6 bedrooms and 3 bathrooms. Grey Leaves is significant in contributing to the creative accomplishment of 20th century architectural design in both the local region and state. 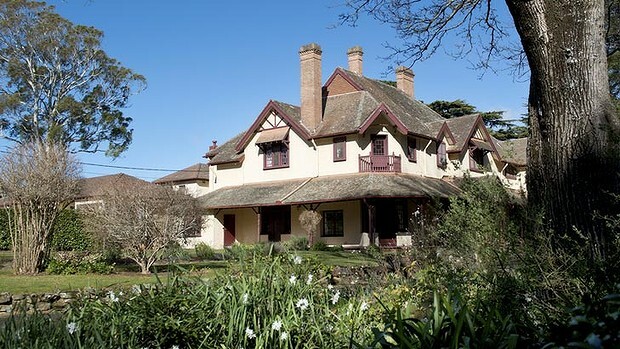 The building is a particularly fine and intact representative (the most intact of Wilkinson’s houses in the Bowral area) of an “Interwar Mediterranean” villa, and more generally of the work of its architect Leslie Wilkinson, displaying a high degree of integrity in its aesthetic qualities and a high quality of workmanship in its construction. “A romantic and accomplished fusion of the Meditrranean vernacular with its simple fenestration pattern of shuttered sash windows, pergolas and loggias and the simple Colonial Georgian style. Built in rendered brick with a cream lime wash (now pink), deep grey blue shutters and Marseilles tiled roof, the house is approached by a long drive past a loggia extending the whole length of the bedroom wing and into a walled garden complete with a lily pond, fountain and espaliered apple and plum trees across the walls. Greyleaves … features include magnificent gardens and a tenniscourt. Greyleaves … features include magnificent gardens and a tennis court. Amboise is set on over 1 ¼ acres (5165m²) in one of the districts most sought after locations. This level parcel of land, with a superb northern aspect, is beautifully private and enjoys a well established garden. The house, truly the epitome of country living, with polished timber floors, 10ft ceilings, formal lounge and dining rooms, north facing casual living areas including meals and sitting rooms, adjoining a modern kitchen with walk-in pantry, reverse cycle air conditioning plus separate central heating. Sold for $5.65 million in 2005. For sale for over $5 million. The landmark residence, built in the 1930’s after fire damaged the original building once set on 20 acres. Now on 2.093 acres, “Patchway” as it is today after a superb extension and renovation, sits in the original garden that dates back over 100 years. A magnificent ‘Wilkinson’ inspired full brick family home situated on almost an acre of level land, at the end of a cul-de-sac in the ‘Golden Triangle’.